The kitchen is fully equipped with all of the utensils and appliances you’ll need to create your favorite island meals. The bedroom has a luxurious queen size bed and newly renovated private bathroom with gorgeous shower. Take a break from the sun and catch up on your favorite team with the large wall-mounted 55" flat screen (SMART) TV. There is a washer/dryer in the unit for you convenience. This first floor condo is the closest condo to the ocean, so it is just a short walk to the other side of the street to enjoy Kamaole Beach 1. 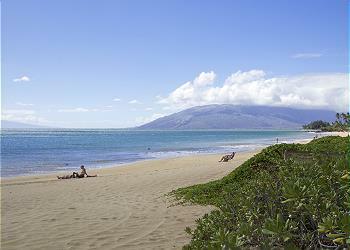 Kamaole Beach 1 is one of the best beaches in Maui. The condo has beach chairs, beach towels and a cooler for you to make the most of your beach vacation! The grounds include: a pool, hot tub, two gas grill-equipped BBQ areas with picnic tables, lush landscaping, and free parking. In addition to spending your day at the beach, there are great restaurants, beach activity shops and tons of shopping just steps away! Come enjoy your next Maui adventure from the perfect beach location in Kihei!